Beef, brown sugar, teriyaki sauce, pineapple juice, cayenne pepper hot, garlic, black pepper, jalapeno powder, ginger. The first flavors that come to my palate are a moderate sweet and teriyaki, mixed with a light chile pepper flavor. There's some heat building up. The chewing brings on more of the same, but with a well-defined black pepper. 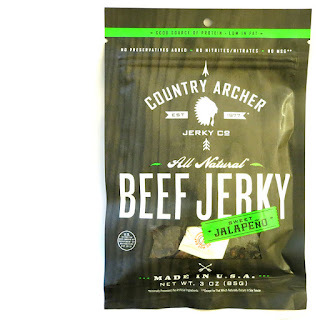 For being labeled, "Sweet Jalapeno" and as a "sweet and spicy" jerky, it's stands up somewhat. There's a fair amount of sweet to this, but it's not sweet enough to brag about. I was expecting something more sweet, such as the company's Teriyaki beef jerky. The jalapeno is noticeable both in terms of flavor and heat, but probably more as heat. The flavor is still rather light. On my personal heat scale, I'd rate this as "medium" (level 3 out of 5). 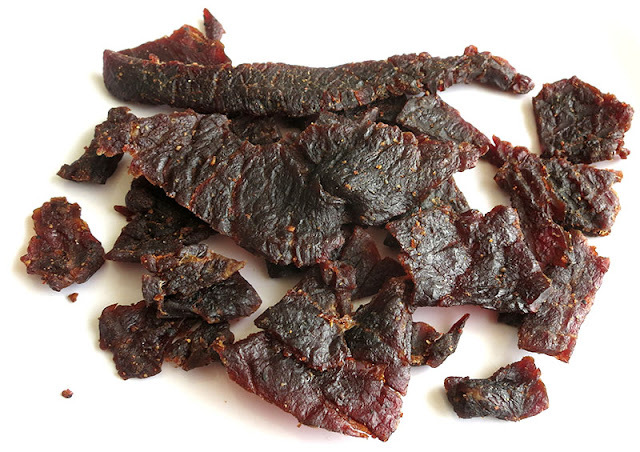 Otherwise, the primary taste profile of this jerky is largely the sweet, but not over-the-top-sweet, with touches of teriyaki flavor, chile pepper flavor, and a noticeable black pepper. The chewing feels chewy, comparable to the company's Original, which is actually on par with most national jerky brands. Once you chew through it takes on a meaty texture, but not like a piece of steak. It's maybe a tad gummy, with just a little bit of fat visible, and nothing stringy encountered. 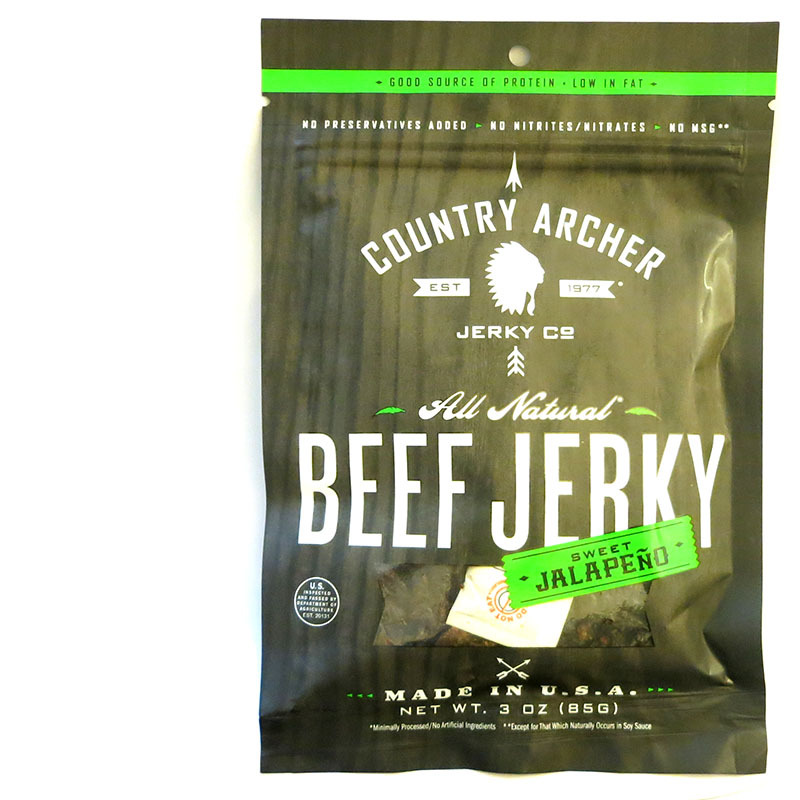 This Sweet Jalapeno beef jerky from Country Archer does offer some sweet, but I felt it could have been a little more sweet for something that advertises itself as "sweet". It does a better job on the jalapeno part, giving you a little bit of a chile pepper flavor, but with a decent amount of heat. This also generates a fair amount of spiciness from the black pepper, which ends up getting in the way of the jalapeno, and may be an important consideration for you chile pepper lovers. Otherwise, there still is this unremarkable character to it, somewhat ordinary as a spicy teriyaki jerky. 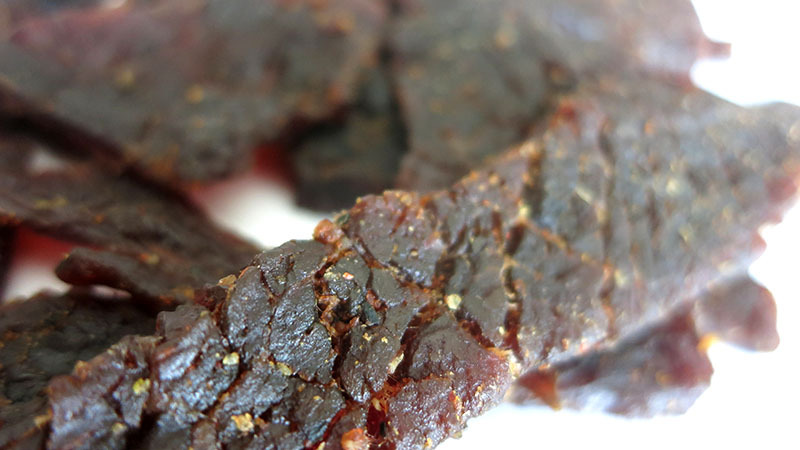 I do like the volume of spice and spicy flavors, but it's hard to say that this jerky differentiates itself from other sweet and spicy jerky brands.